NoMouse wrote: Oh, wow, we don't need to ottify Rosetta's landing, GLR is ottfying it for us by making a Time-like othercomic. Actually, this othercomic seems to be spacelike. Thus confirming that the comiverse includes both Time-like and spacelike comics. What's the scale in this zoom? speising wrote: But they need a bard singing "build, build, build the raft! " 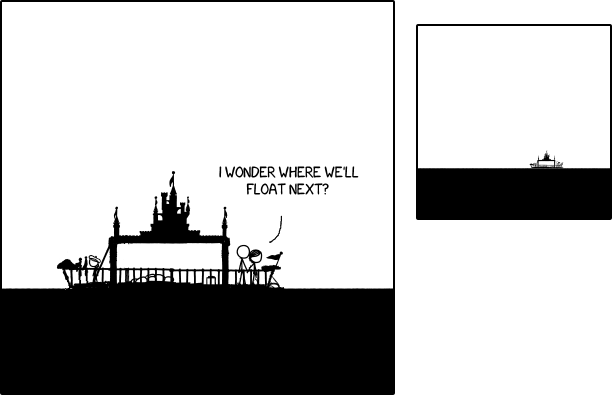 Arrgh now my brain is spinning through endless permutations of OOTS / XKCD crossover storylines! I'm going to be stuck on that all day.